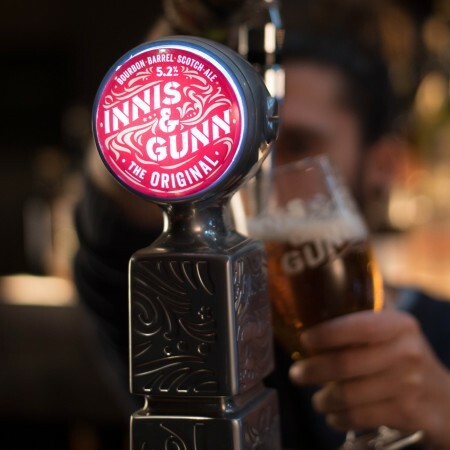 TORONTO, ON – Innis & Gunn (I&G) has announced details a new partnership that will see several of its brands produced at Toronto’s Brunswick Bierworks for the Ontario market. I&G beers including The Original, Gunnpowder IPA, and Lager will be brewed at Brunswick with the same recipes, ingredients, and barrel-aging processes that are used in Scotland, and will be distributed in 30 litre kegs to bars and restaurants throughout the province. Bottled and canned product will continue to be imported from Scotland. The statement also notes that I&G and Brunswick plan follow two collaborations released last year – Kanzan & Sakura sour cherry witbier, and Innk & Gunn New England IPA – with additional co-branded small batch releases in the future.